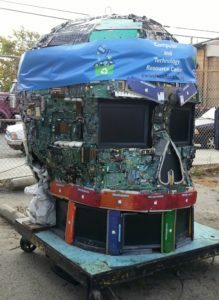 FAQ’s about how we recycle electronics, how your donation is tax deductible, and how you or your organization can receive a free refurbished computer. How do I go about getting a free computer from CTRC? You qualify for a computer if you are low income, age 18 or older and submit a complete application which includes a copy of your income verification. Download and print an application from our website. Choose the Individual application unless you represent a non-profit or school. Mail completed application to: CTRC, Placement Dept., 42 Digital Dr #3, Novato CA 94949; or send us a SASE, and we will mail you an application. You may also pick up an application from our Marin or Alameda facility; or, call us at (415) 883-1428. How long will it take for me to receive my computer once I apply? After being approved the wait time could be 2-3 months. The Marin waiting list is usually a little shorter. We will contact you if your application is incomplete. If it is approved we will call you when your name moves to the top of the list. To find out where you are on the waiting list, please call Janny at 510 367-1717 on Saturdays between 10am – 4pm. Can I get my computer shipped to me? What sort of income verification is acceptable? The application must be in the name of head of household. The name on the application must match the name on the income verification document(s). We donate one computer per household. Examples of income verification: documents: current (within 30 days) check stubs, social services income verification letters, unemployment check stubs, bank statements with direct deposit information, proof of disability. You can black out your SS# and account numbers on all documents, but we need to be able to verify name and address. Do not send originals. Do not send bills or rent receipts. If you have a verification that falls outside of these categories – please call Janny at (510) 367-1717 on Saturdays between 10am – 4pm for more information. Please know that applications without income verification will not be processed. What kind of computer will I receive? NOTE: At this time we are placing the following computer: 2GB of RAM or higher, minimum 80GB HDD, with a DVD-ROM drive and 17 ” monitor or better. All systems come installed with Linux XUBUNTU 14.0.1. We do not provide modems, speakers or printers. Can I get a laptop? Unfortunately, laptops are not available for placements. Do I have to be a resident of Alameda or Marin County to receive a computer? If your equipment is in working or easily-repairable order, we will fix it and place it with a charity, non-profit, school, or a low-income or disabled individual somewhere on the planet Earth. If we cannot reuse equipment, we recycle electronics by sending them off to approved, environmentally-friendly secondary recyclers. Cathode ray tubes are smelted, allowing the lead to be removed from the glass so that both can be recycled. Circuit boards are ground up so that a number of different metal recovery processes can be used to reclaim the various nasty alloys that are in them. Computers affect us all. For those of us well versed in the digital arts, the computer can be a tool for good. But for those who do not have access to technology nor to a computer of their own, the digital world can be a complete abyss of terror and confusion. It may be a cliche to speak about the digital divide, but there’s really no other way to describe the gap between the digital haves and the compu-havenots. We must bridge the divide. We serve the public by refurbishing used computer equipment for which businesses, corporations, and individual donors no longer have a use. How do I clean the data off my computer/hard drive? We offer drive wiping service for $10 per drive. Do nothing. This allows us to simply reformat the drive and use it in a rebuilt computer. Format the drive yourself. The disk will remain in working order and we will be able to format it a second time and use it in a rebuilt computer. Pay us to either wipe or degauss your drive. For a fee (see above), we will completely wipe your hard drive and install a fresh operating system, so your hard drive can be reused. If the hard drive cannot be wiped, it will be degaussed. Degaussing a drive renders it useless. After we degauss your hard drive, we cannot use it in a rebuilt computer.